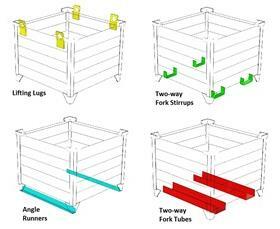 Add-On Options For Corrugated Bulk Steel Containers | Morrison Industrial Equipment Co. Lifting Lugs - 3/8" thick x 4" x 7" lifting lug with 2-1/2" diameter hole. Set of four welded on. Added to widest sides by default. Cannot add to containers with a Drop Gate or Hopper Front. Made in accordance with ANSI MH 26.1-2004 for Industrial Metal Containers, no other lifting certifications otherwise. Two-way Fork Stirrups - 3/8" thick x 2" wide bar with 3" x 6" fork opening for 2-way entry on widest side by default. Set of four welded on. 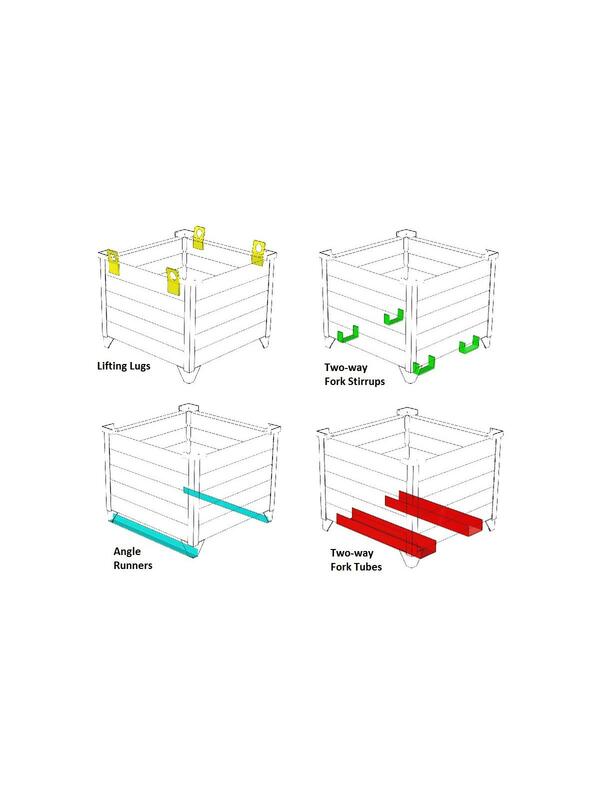 Center to center spacing as follows per widest side of container (plus/minus.5"): 8.75" for 24"W, 13" for 30"W, 19.63" for 35"W, 21.63" for 42"W and 21.63" for 48"W.
Angle Runners - 3/16" x 2" x 2" angle runners. Set of two welded to narrowest side by default. 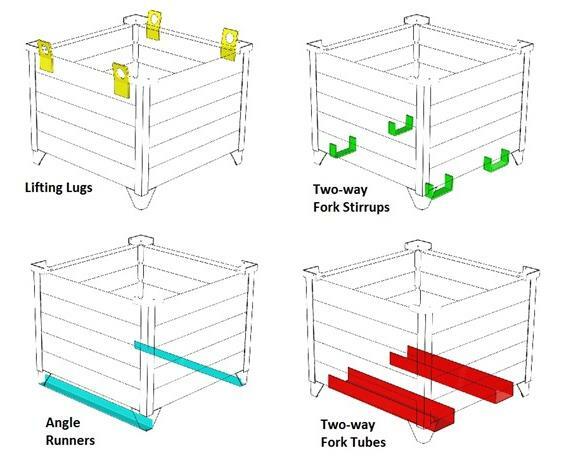 Two-way Fork Tubes - Set of 2 welded on 10 ga. formed fork tubes/channels with 3" x 6" fork openings for two-way entry on widest side by default. See Related Items tab for Corrugated Bulk Steel Containers. FOB Shipping Point.